Application Status – How can we help you? By default, there are four statuses that will automatically be assigned to applications: Not Started, Incomplete, Pending, and Submitted. An application with a Not Started status is only going to be placed on an application when you use the Program Matching feature. This status will be placed on applications that are selected and saved by an applicant, but aren't yet started. The application will automatically change to Incomplete when the applicant opens the first page of the application. An application with an Incomplete status is one which has been started, but not yet submitted. The application may not have all required information completed or the applicant may not have yet submitted the application. An application with a Pending status is one where the applicant has clicked the Submit button, SmarterSelect has validated they have answered all required questions, but the applicant has one or more required Information Requests/Recommendation pending (e.g. awaiting a response from a recommender). When all required Information Requests/Recommendations have been received, the application will automatically change to Submitted and the applicant will receive an email notification. An application with a Submitted status is one which has all required information completed and the applicant has submitted the application. As the administrator, you can manually change the status of one or more applications at one time. The only statuses that an applicant will ever see are Incomplete and Submitted. Any other status you use will be purely informational and confidential. By changing an application's status, you will be better able to see which applicants are to be reviewed, have been reviewed, are not eligible, are finalists, and are recipients. 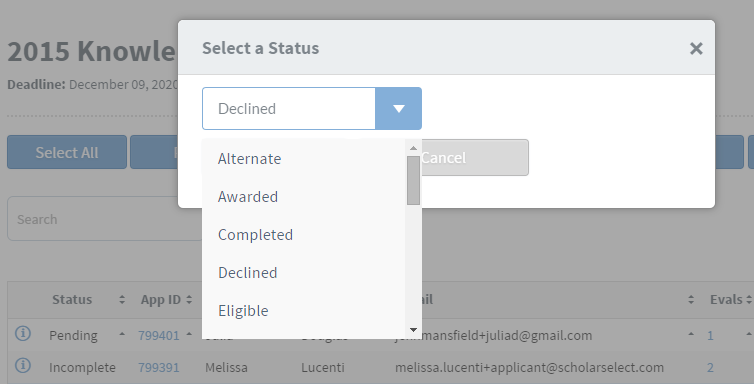 To change an application's status, click on the application that you want to change and then click on the "Status" button at the top of the screen. Select the status by clicking on the scroll bar down arrow and then scrolling through the options. Click on the status that you want from the list then "OK."